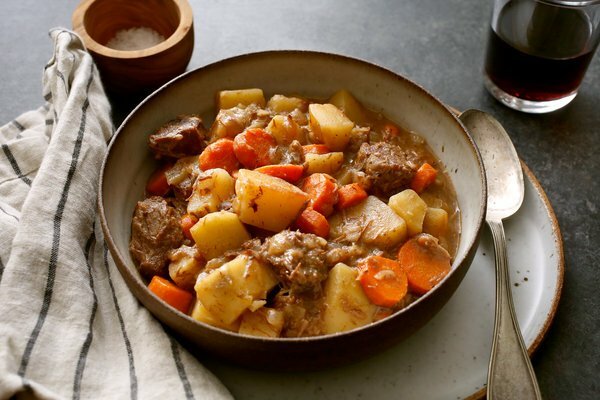 Like most slow cook meals, beef stew most likely came about to make tough, chewy cuts of meat manageable. The upside was that these cuts of meat were chock full of flavour. The thick rich sauce along with the potatoes and whatever root vegetable was in the house made a hearty meal. Toss meat in flour to coat. Heat oil in cooker over medium high heat. Brown meat on all sides (you will need to do this in 2 batches removing the meat each time). Add onion and cook for 2 minutes. Return the meat to the cooker along with salt, pepper, thyme garlic, celery wine and stock. Cover and bring to high pressure. Reduce to medium and cook for 10-12 minutes. Remove from heat and manually release steam. Carefully open lid and add potatoes, carrots and peas. Cover and return to full pressure. Reduce heat and cook for 2 minutes. Allow steam to release naturally. Open cooker and serve in bowls.